Despite a late night of trying to catch up on my blog, and at least one whisky, I was up early and sorting out my maps, keen to get a good start on my next leg into Kent and onwards towards Latitude. I wasn’t sure where I was heading for today, Ramsgate maybe, or somewhere close to it; I figured I’d look for somewhere a bit later once I’d got some miles done. Mum cooked me a nice fry-up for breakfast to ensure a vital start to the day, after a cup of Red Bush tea in bed courtesy of Dad, a very good start to proceedings. I also had clean clothes again, sufficient to see me back to Norwich, after making use of the washing machine. Breakfast consumed I packed up and loaded everything on to my trusty Ridgeback, which was running very nicely after the bit of bike maintenance yesterday. I managed to get on the road just after 09.00, bidding goodbye to my excellent hosts. Mum had of course made me some sandwiches which would be welcome later, perhaps for second breakfast; I rarely manage to leave my parents without some kind of offering. I’d see them again soon in any case, back in Norwich upon my return. 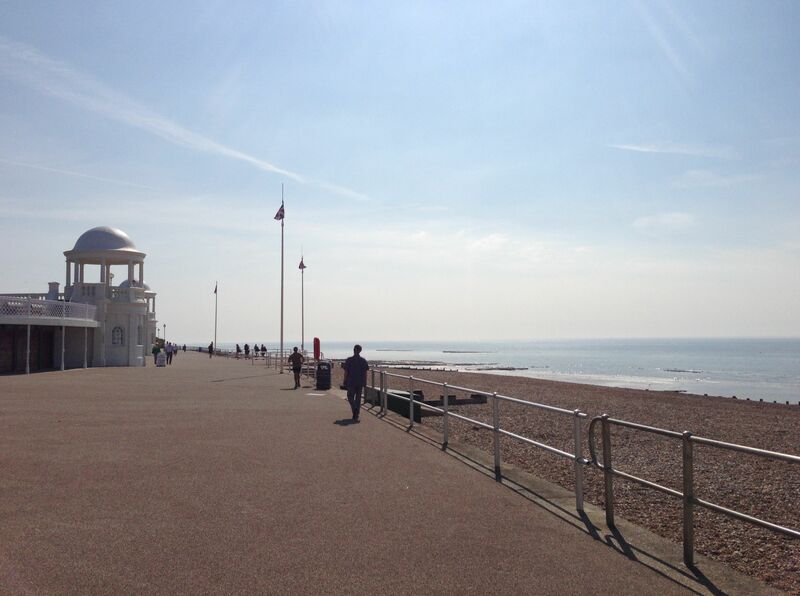 I pedalled off, once more under sunny skies, making my way back down to the coast via Little Common and Cooden Beach, before turning east to Bexhill-on-Sea where I was able to ride along the promenade. 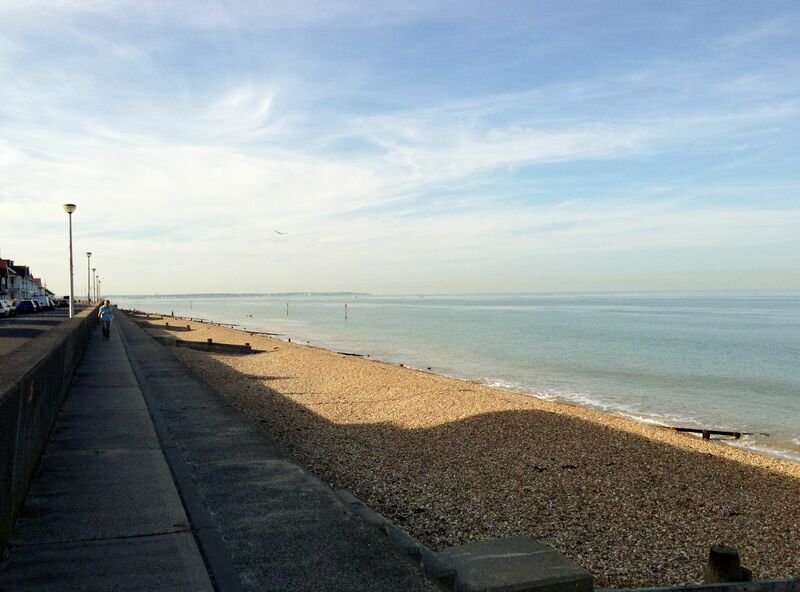 The promenade has only just been opened up for cyclists , and makes for lovely riding all the way along the seafront, before you take the cycle path up over Galley Hill and down into St. Leornards and Hastings. 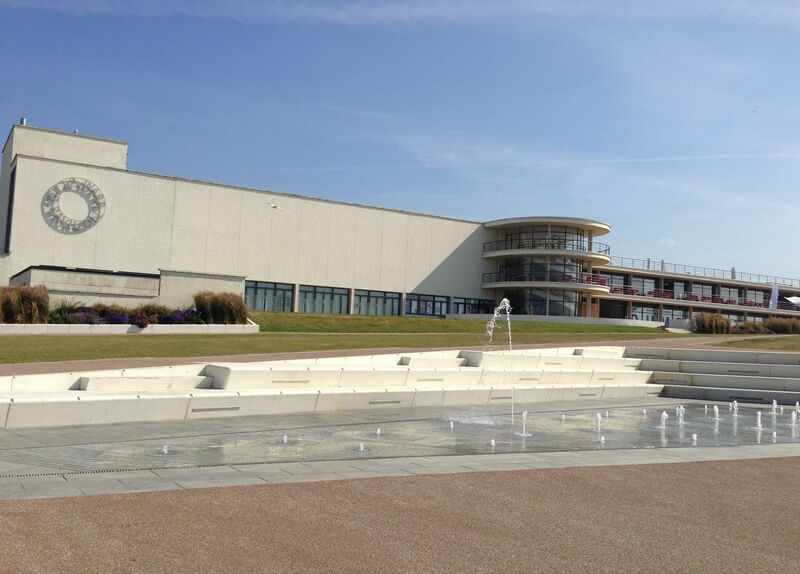 I passed the Delaware Pavillion in Bexhill, a building of the Art Deco style which a lot of people love; I’m remain sceptical of its aesthetic qualities. The cycle path to Hastings, which didn’t used to run all the way along this bit of the coast, meant I avoided the very busy main road. I met up with Ian again who has an office near the town centre, from which he runs Technology Box. Check out their website http://www.technologybox.co.uk/ for all your business technology requirements. We grabbed a quick coffee in a cafe downstairs from the office, and Ian added a Wagon Wheel (the biscuit variety) to my food supplies. I was going to end up putting on weight during the course of the tour at this rate, however it was important to ensure I maintained energy levels. After once more parting company I rode through the rest of Hastings, past the castle up on the hill and the Old Town, then down to tall black wooden huts where they used to smoke fish. I don’t know if it still does however Hastings used to boast the largest beach launched fishing fleet in Europe, and although reduced in number there are still lots of boats pulled up on to the shingle. There are several nice fish and chip shops, fishmongers and seafood restaurants down at Rock-a-Nore, including Webbes which I’d definitely recommend. The town didn’t seem to have changed very much since I was last there, and I had a moment of nostalgia as I pedalled past the Carlisle Pub, where I used to go in my younger days. The Carlisle is a biker pub which meant it used to be relatively safe compared with some parts of Hastings, because the usual trouble makers avoided it; good to see it’s still going strong. 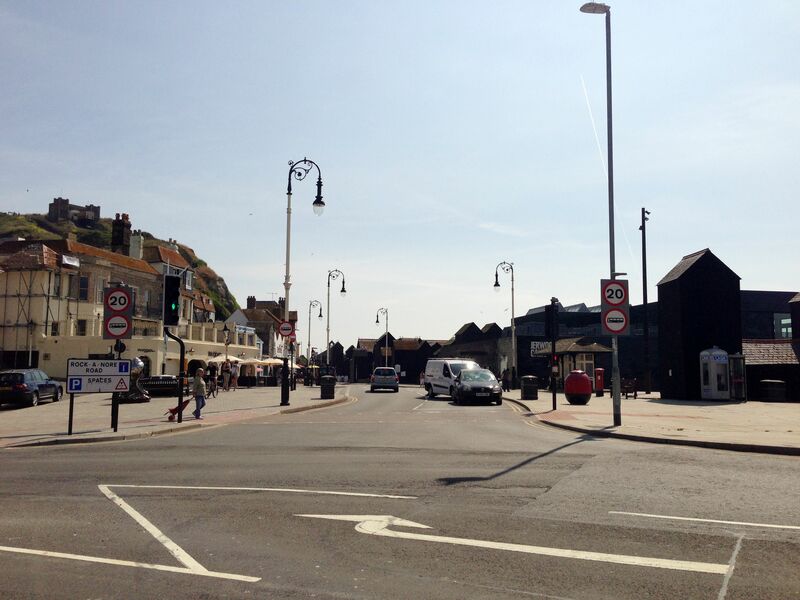 The seafront looked much the same too, with the same mixture of out-dated amusement arcades, and crazy golf courses. I’m surprised amusement arcades still survive given that so many households have a games console or PC these days. They’re probably all money laundering fronts or suchlike. The pier still looks sad having been set on fire by an arsonist a few years ago, however there are now plans to re-develop it into a community space which is good news. Hastings can be a fun place at the right time of year, especially during the summer if the weather is good, with the Jack-in-the-Green festival in May, the dress like a pirate day, and frequent biker rallies. I turned inland at Rock-a-Nore, cycling up the hill to Fairlight. It felt like quite a big hill, however I didn’t really mind figuring a lot of the ride today would be across flat territory, with a few notable exceptions around Folkstone and Dover. It was good to get my legs going again, and meant I had a feisty descent through lovely countryside down to Pett Level, where everything does indeed level out. 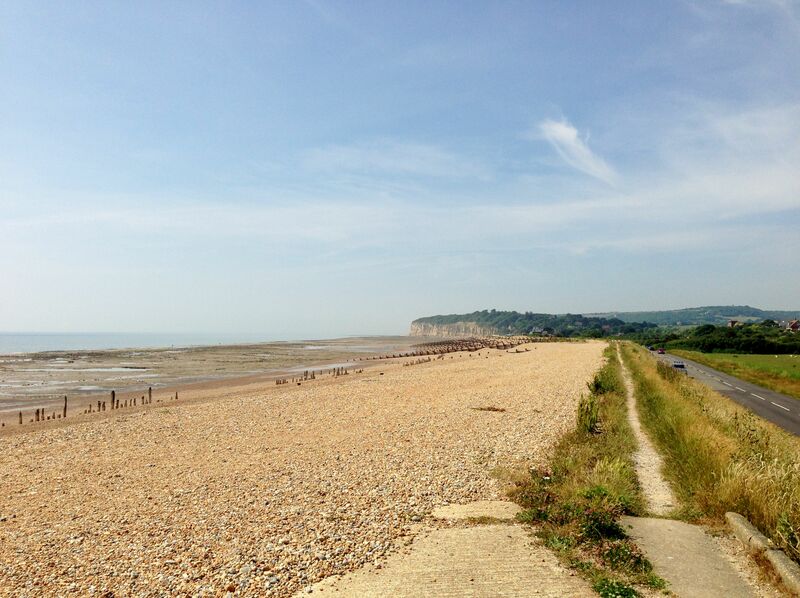 There followed a flat stretch along Pett Level Road, which runs parallel to the beach behind the large embankment built to keep the sea from flooding the low lying land. I stopped and climbed up to the top of it to take in the view. One of these days a big storm will breach the embankment and the sea will come pouring through, perhaps making Winchelsea a port again. I wasn’t going to pass through Winchelsea today, another ancient town which has been rebuilt several times over the centuries due to floods, fire, and attacks by the French; it’s worth a look if you’re passing that way. I continued along the coast, following a route Ian had told me about earlier, and checking directions with another cyclist also making their way towards Rye. She was travelling at a more sedate pace, complete with shopping basket, to meet a friend at a pub in Rye for lunch which sounded like a very good plan seeing as it was starting to get very hot. 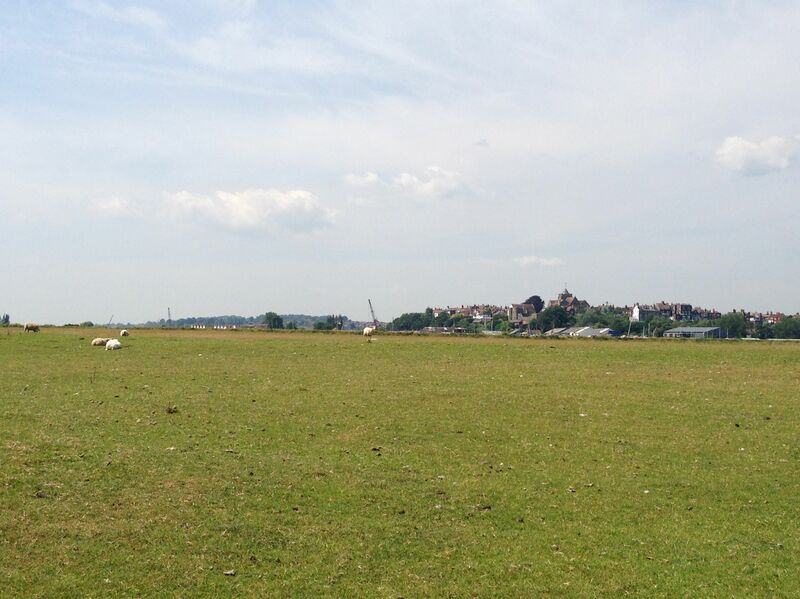 The cycle path I was following made its way through a field full of sheep at one point, as I rode around to Rye Harbour. Of course a few of the beasts gravitated towards my bike intent on throwing themselves in front of my wheels, however I managed to avoid them with a few emergency manoeuvres; it seems they’re just as stupid in the South East as everywhere else. 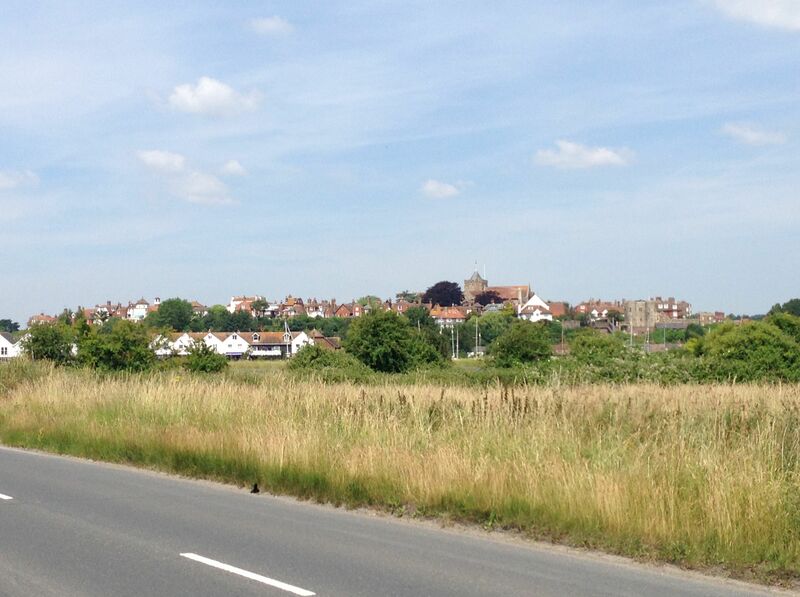 The cycle path was great for the most part, with no traffic and a good surface, meaning I made good time around to Rye where I stopped for a break. Rye is a lovely town, and another of the historic Cinque Ports, or Confederation of Cinque Ports which were important centres of trade and defence in medieval times. Rye was also a big centre of smuggling during the 18th and 19th centuries, as were many of the coastal towns in East Sussex and Kent. It’s set on a hill overlooking a small harbour on the river below. It being very hot I bought an ice cream, then decided I was hungry and ate the sandwiches Mum had made me, despite it not being that late as yet. I had a good walk around the town, peering in small shop windows at various attractive foodstuffs, including the numerous baked goods at Simon the Pieman’s, Rye’s finest purveyor of pies and pastries. I also took a wander around St. Mary’s Church which was lovely and cool, as well as being very peaceful after Rye’s bustling streets which were full of tourists. As I’ve done before on the tour I made a donation and lit a votive candle in the church to remember Lu by, not because I’m particularly religious, agnostic at best, but because it seemed like a nice thing to do. After giving Lucy’s parents a quick ring to wish Sheila good luck with an operation, I left Rye behind I stuck to the coast around to Camber, with its sand dunes. The road was pretty busy and narrow so it was good to get on to a cycle path as I rode up to Lydd, into an easterly breeze which helped keep me cool, even if it did slow me down a bit. It was continuing to get hotter as morning turned into afternoon, I reckoned into the 30’s, and I was very glad of my two water bottles. 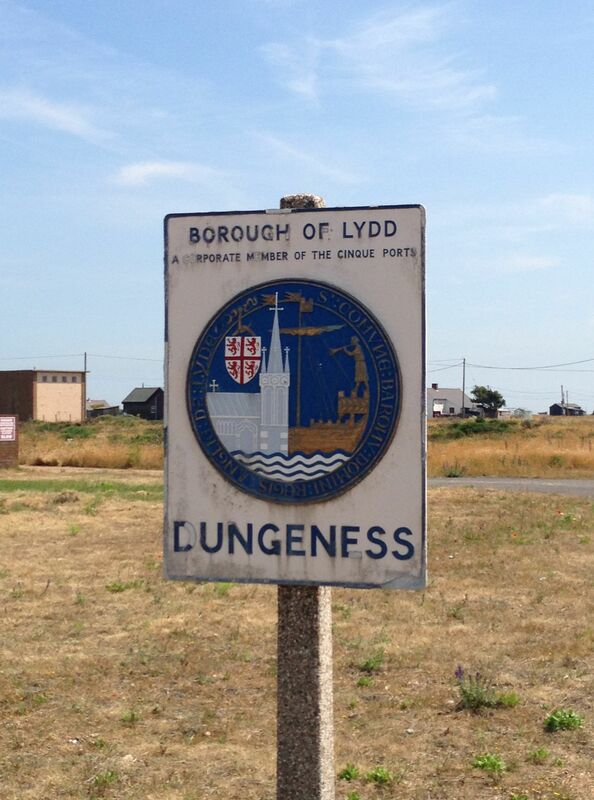 I cycled through Lydd and down to Dungeness and its Power Station out on the point. I was trying to remember what the landscape around here reminded me of, and I realised it was a bit like the badlands in the computer game Fallout 3, which I played a few years ago (great game). 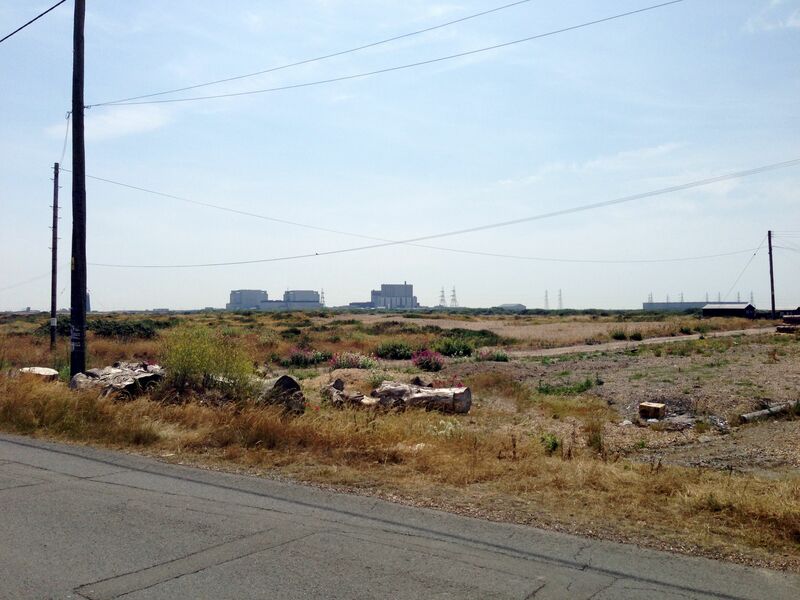 The big old nuclear reactor dominates the landscape, as do all the power lines running from it which unfortunately make the countryside look a bit ugly. The flat terrain also meant the Easterly felt stronger, and I was beginning to tire of cycling into a headwind, but still had miles to go. After Dungeness there was what felt like a long stretch around to Hythe and Folkestone, with the traffic getting heavier. I rode alongside the Dymchurch railway line for a bit, on which a steam train runs between Romney, Hythe and Dymchurch, and down to Dungeness. There’s quite a big hill up into Folkstone, the second of the day and a chance to burn off some of the calories I’d been consuming due to frequent ice cream stops. I had a quick ride around Folkstone and bought a new notebook to use as a journal, and some pens, having been running low of ink and paper. As usual for this time of year coastal towns in the South East were swarming with foreign students who spend a few weeks over here learning English. I spent a few summers teaching them when I was at University, as a summer job; good fun but low pay and pretty tiring trying to ensure they don’t get themselves into trouble all the time! Scandinavians are well behaved, Italians and Spanish not so much but a lot of fun. After Folkstone I dropped into the Battle of Britain memorial, which is up the top of another big hill. Thankfully there’s also a cafe there so I was able to buy a couple of cold cans of lemonade. I’d have had to tackle the hill whichever way I went so it was worth stopping in at the memorial. I hadn’t realised the memorial was in honour of all the allied pilots that fought in the Battle of Britain, and not just the ones who’d lost their lives. I spotted the name ‘Eeles H’, the father of a friend of the family Tom Eeles. There was a ‘Harvey’ on there to but as far as I know they’re no relation. After Capel-le-Ferne there followed a lovely ride downhill all the way to Dover, from where I could clearly see France across the Channel, in fact I don’t think I’ve ever seen it so clearly. It didn’t look very far away at all but I still wouldn’t fancy trying to swim across; maybe windsurfing it if I got a lot better at it, and could avoid the ships. I spent a few minutes down by the port, taking in the view. There were people relaxing on the beach which I hadn’t quite expected in one of the busiest ferry ports on the coast. 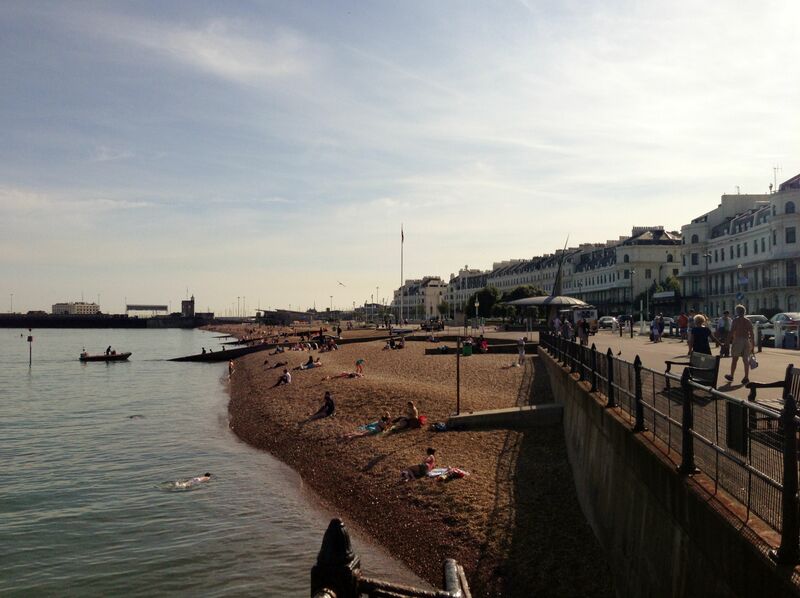 The beach looked like quite a good place to be in the hot weather, and I was quite tempted by another ice cream. Resisting the temptation of another frozen dairy product I pedalled up past the castle, and stopped at the top of the hill to look back down on the channel. 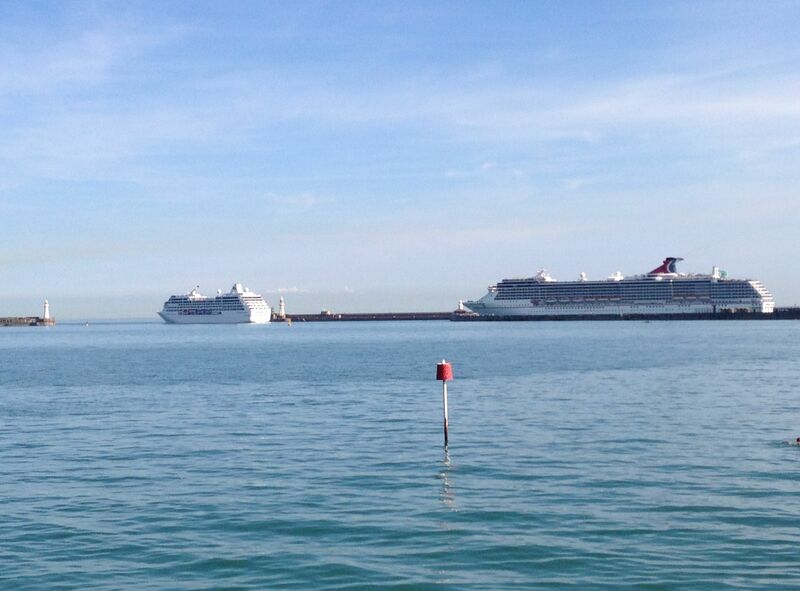 The ferries looked like toy boats in the bath from up here, and the coast of France was even clearer. I joined the A258 to Deal after turning off the A259, the road surface of which was really shoddy. The A259 in Kent has one of the worse road surfaces I’ve cycled on, probably due to all the heavy traffic going to and from the port. It consists mostly of patches rather than the original road surface, and is really uncomfortable to ride on after a while as it constantly jars your wrists; I was very glad to get off it. 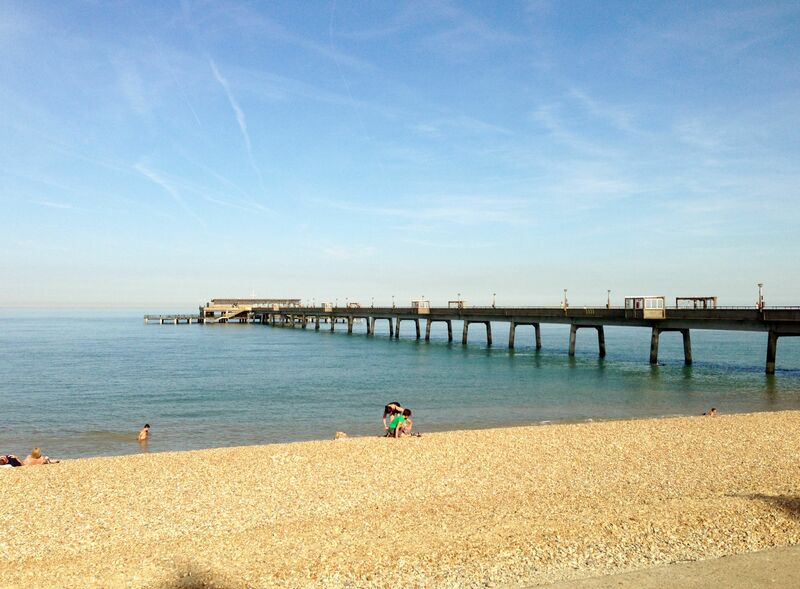 Deal looked nice in the evening sunshine, with lots of people on the beach again, or sipping wine on the seafront. I passed groups of people having fun together and for the first time in while felt in need of company, probably because I’d been spending time with friends or family recently. I knew I’d be seeing lots of friendly faces at Latitude, all being well, so I kept that thought in my head and pedalled onwards. The sea looked very inviting and I was sorely tempted to take a dip to cool off, but needed to find somewhere to camp for the night soon so pressed on. I took the quiet minor road from Deal round to Sandwich, which passes through the Sandwich Estate and is marked as a toll road. The toll gate was open and unmanned so I passed straight through along with several cars doing the same; maybe it’s not a toll road any more, or free at certain times of day. Sandwich is a pretty place, with nice old houses, a quay by the river, and at least a couple of good looking pubs. I forgot to take any photos as I had a close encounter with an elderly driver who didn’t look my way at a road junction and nearly ploughed into me; evasive action saved the day and I quickly pedalled over the bridge and out of harms way. 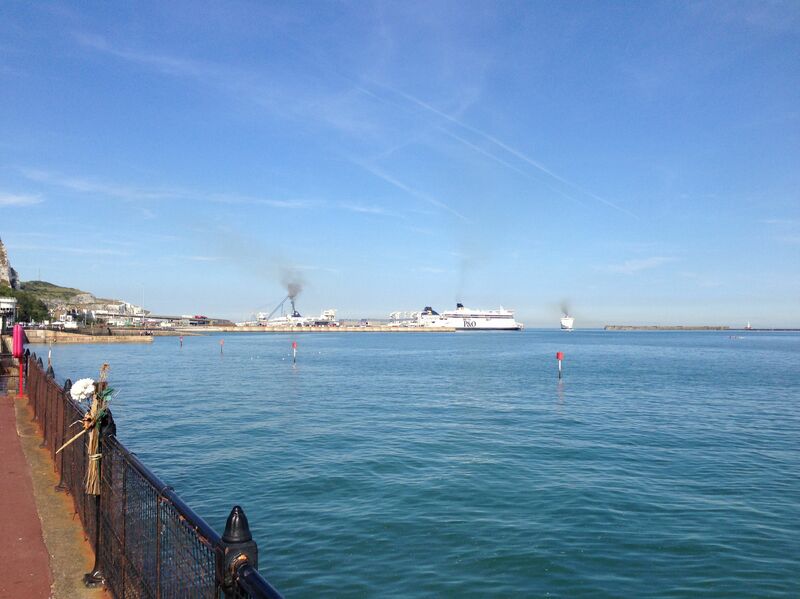 The last stretch around to Ramsgate was mostly on cycle paths, thus avoiding the traffic which was a relief. I passed a few other cyclists out for an evening ride and exchanged customary nods. 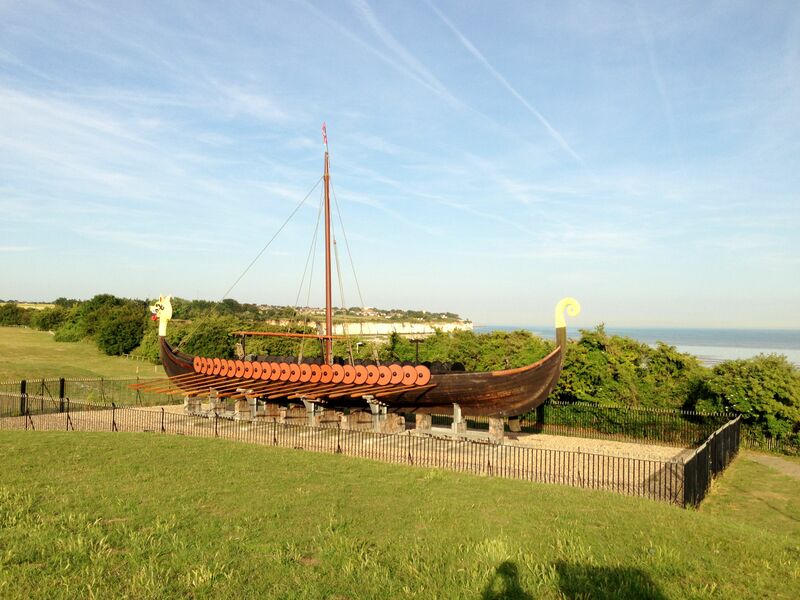 This part of the coastline encompasses the Viking Coastal Trail, which I’d ride along tomorrow, and as I entered Ramsgate I passed a replica Viking longboat with a rather gaudily painted figurehead. I arrived at the campsite I’d found via my phone during an earlier stop, at about 19.00. The Nethercourt Touring Park is a nice small campsite, situated in a park just on the outskirts of Ramsgate, but really not very far from the town centre. It was a bit pricey at £15 however I was in need of a shower after a hot day’s ride, so didn’t mind too much, and the caretakers were nice people. If I ever do a longer tour in Europe, or off to New Zealand via Asia, I’ll have to work on a much tighter budget and wild camp more. Thankfully wild camping is much less frowned upon in Europe, for the most part anyway. After pitching my tent I headed up the hill to the local pub for dinner and a couple of pints, and ended up chatting to the chef then the landlady for a while; I think this worked in my favour as the curry I ordered was on the large side and very tasty. After dinner it was back to the campsite where I got talking to a couple of fellow campers over a glass of wine; they were down in Ramsgate scouting out the area. He’d just got a job down here so the whole family were about to move south from Yorkshire or thereabouts (might have got that wrong but it was definitely further north), including two young kids. This trip was all about convincing the two youngsters that it was a good idea, and show how much fun it could be to live beside the seaside. I didn’t think they’d have too much trouble if the weather stayed like this. I’d covered about 82 miles today, but it felt shorter due to much of it being flat riding. Riding across flat terrain can be a little tedious but was nice for a change, and with the hot weather it had made for a pleasant day. Tomorrow I’d be riding round to the Thames Estuary, then finding a ferry to take me across it, probably at Gravesend. Nigel had confirmed he could make it down for Latitude so everything was lining up nicely for the end of the tour; lots to look forward to still. This entry was posted in Bike around Britain 2013 and tagged adventure, bicycle, bike, Bike around Britain, charity, countryside, cycle, cycle touring, cycling, Dover, expedition, fundraising, Hastings, outdoors, photos, Ramsgate, Rye, sunshine on October 17, 2013 by SelfPropelled.